Just a little change of pace for the blog – below is a rejected copy of my first article and photo gig for The Roanoker Magazine. The published article can be found in the magazine (as well as a few more photos here), but I wanted to give you all a taste of what I’ve been spending my time with lately. 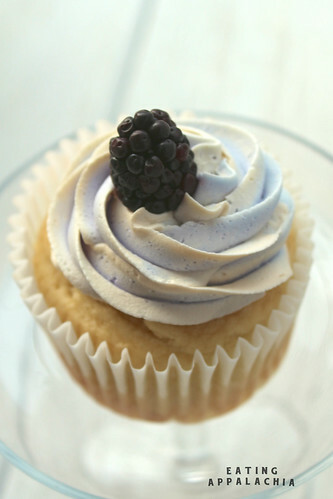 Speaking of which, I have some deadlines I’m racing to meet, so enjoy the review of two of Roanoke’s finest cupcake shops and I’ll be back next week with my Atlanta posts and maybe even a few recipes. The world now has its first cupcake ATM thanks to Sprinkles in Los Angeles. Popping out over 1,000 freshly baked and frosted cupcakes per day, the twenty-four hour machine cements cupcakes as America’s twenty-first century favorite treat. 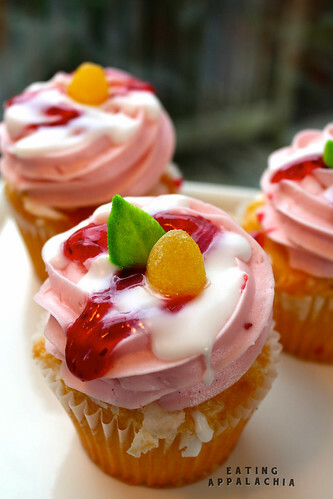 Though the cupcake craze extends back to New York City’s Magnolia Bakery in 1996, the height of the frosting frenzy peaked post-2000 and hasn’t yet fallen. 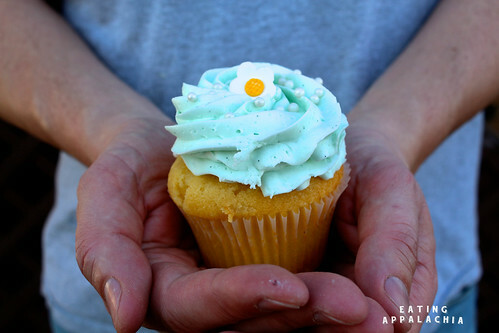 Two bakeries here in Roanoke, Lisa Lusk’s Bubblecake and Pennie Ahuero’s Viva La Cupcake, are proof that baking and decorating cupcakes is sweet business if you get the recipe right. 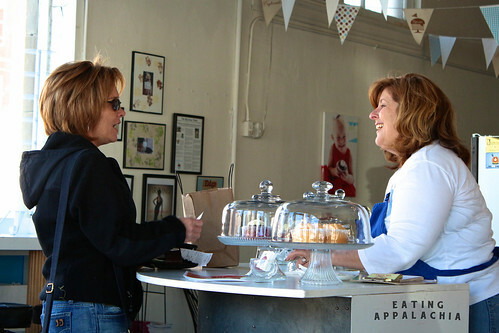 Both Lisa and Pennie preheated their ovens and began selling cupcakes in the summer of 2009, but each went about building their business in their own way, with their own flavor. 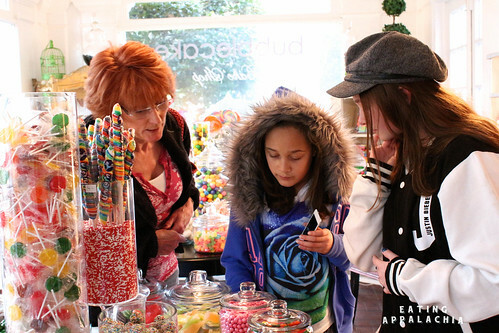 Walking into Bubblecake in Crystal Spring is like walking into a real-life version of Candy Land. The pink striped walls play off white porcelain and crystal cake plates, a window-lined sunroom offers old-timey pharmacy jars filled to the brim with gum balls, rock candy, and lollipops. On warmer days, it’s not uncommon to see families enjoying a cupcake or cone of vanilla bean frozen custard in front lawn bordered by a white picket fence. The centerpiece of the bakery, of course, is the cupcake case–the concave glass holding back dozens of perfectly frosted cupcakes arranged by flavor. A tiered cake stand near the register displays Babycakes–miniature versions of customer favorites like Tiffany, Black & White, and Birthday Cake. On the far right you’ll find the uber rich and decadent Brownie Cupcakes–cupcakes whose base is a dark fudge brownie. Between the two are the mainstays of Bubblecake: the regular sized cupcakes. Tiffany, the signature cupcake, features a vanilla bean cake with a light almond frosting colored like the diamond boxes of its namesake. Mudpie, a chocolate base with coffee icing, coffee caramel, crushed chocolate cookies, toffee bits, and marshmallows sits at the other end of the spectrum–it’s a chocoholic’s daydream, the moist cake complementing the slightly bitter yet fluffy coffee ice cream, the caramel and toffee bits reminding you that, like Lisa hopes, this is not a dessert you would regularly make at home. It’s a treat. The confectionary perfection of Bubblecake is a direct result of Lisa’s experience both as a pastry chef and as a marketer. Before moving to Roanoke, she attended the Culinary Institute of America and was a member of the second graduating class of pastry chefs. After working several pastry and food marketing related jobs in Philadelphia, New York, and Miami, she spent a trial a year in Charlotte, North Carolina, feeling out a potential business opportunity with her husband Rob. That year, instead, brought the cupcake bakery model to her attention and she realized that the Roanoke was the perfect market for a bakery. Feeling the out the demand for a while, Lisa baked out of her home, but quickly realized she needed a commercial kitchen and storefront. When the white clapboard house on Crystal Spring Avenue became available, she snapped up the lease and the rest is history. 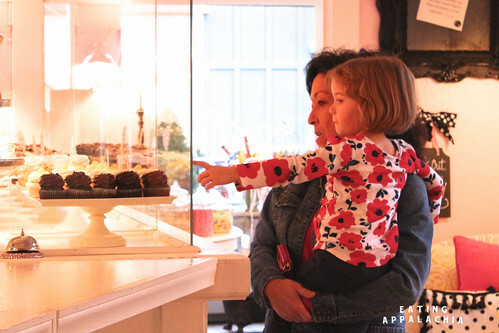 As luck would have it, the corner location at Grandin Road and Memorial Avenue opened up and, together with design help from her brother, Pennie opened the Viva La Cupcake as we know it in autumn of 2010. The space is light and bright from the store’s large plate glass windows and pastel blue and pink patterned bunting hangs from the tall ceilings. 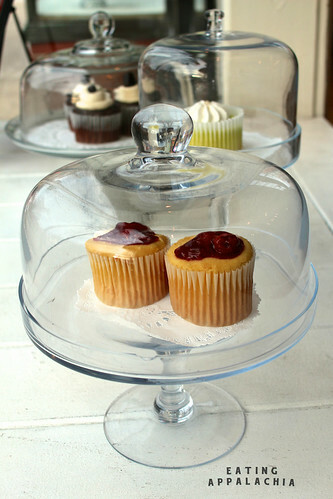 Cupcakes are displayed on Pennie’s ever-growing collection of antique glass cake stands and Parisian-styled café tables allow for plenty of in-store seating. It’s a more modern take on a bakery and fits in perfectly with Grandin’s young, hip-family vibe. 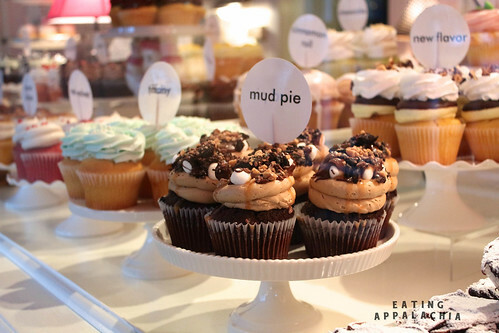 The cupcakes themselves are almost the polar opposite of Bubblecake’s traditional, Southern-inspired flavors. While Pennie bakes a Red Velvet Cupcake, it’s often topped with dark chocolate ganache instead of the typical cream cheese frosting; her other signature flavors are more reminiscent of pies and ice cream than cakes. The Key Lime Pie is moist and tastes exactly a like a key lime pie—a dollop of vanilla icing and cookie crumble heralding to the pie’s traditional meringue topping and crust. A Ghirardelli liquor cupcake features a dark chocolate truffle in the middle of her signature chocolate cake. 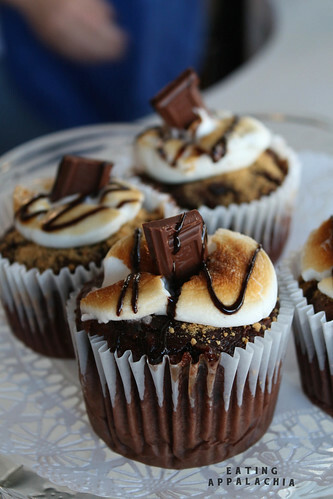 It’s a cupcake for adults with a refined, rich chocolate flavor. While the two shops couldn’t be more different from each other in style and flavors, both owners agree that their neighbors are the people who inspire both them the most. For Lisa, the Crystal Spring neighborhood is her home–“We live down the street, our kids go to school here”—and the same holds true from Pennie whose youngest son attended Virginia Heights Elementary School directly across from the bakery. If anything, cupcake bakeries aren’t a craze to Lisa and Pennie, they’re a fundamental piece of their communities, a gathering place for neighbors to come together and share a sweet moment during a hectic day. Hooray! What a great article–and of course those cupcakes look beautiful. I’m not even a cupcake person (or a cake person, or a frosting person) and I still want one of those beautiful pink-frosted berry-looking cupcakes. Oh wow, those little cakes are to die for… Here I was thinking that the cupcake trend had really blown over, but these clearly have some staying power. That frosting on each and every one looks so luscious! Hi Jes, good job. I only wish that I had been informed beforehand that it was a joint article. Don’t like the feeling of being misled, but you did a nice job regardless. i want to know where i find decoration cakes class in Roanoke .